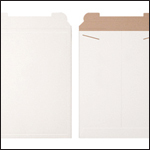 Stay Flat Rigid Mailers, StayFlats Mailers, White Stay Flat Mailers, Kraft Stayflat Mailers, Riverside Paper Co.
StayFlats are Economical and Reuseable. 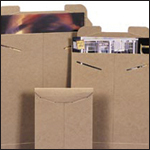 StayFlats rigid mailers are made from heavy fiberboard and have self-locking tabs on the flap for a secure closure. These rigid mailers are ideal for shipping and mailing photos, certificates and other documents that you do not want to fold or bend while in transit. We can custom print these StayFlats mailers with a simple return address or an elaborate 4 color process print. Just give us a call with the details and we'll quote. A simple return address can be printed on a few as 200 StayFlats.